We talked about the robot participant “walking around” at the Fresh Conference in our last blog post, still many of the latest innovations in the event industry were to be introduced. As we know the Fresh Conference has really established itself as the two-day conference that refreshes conferences, meetings and events and increases their effectiveness. All presentations, room layouts, the venue, the staging, the processes, the food… everything is new or innovative or at least interesting enough to investigate. The microphone that could be tossed around to get the conversation going amongst peers,the first ever Google glass app for event moderators that brings all the content to the moderators’ eyes – literally, different apps to enhance the effectiveness of any events like Spotme, MeetingSphere and Sendsteps and our very own cutting-edge webcasting technology, Triskel making webcasting an achievable reality for everyone. It is great to see all these innovative tools in one place, where they are introduced with all the features and attendees actually have the opportunity to try them. Let’s go in the most exciting order – for us anyways – by talking about Triskel. Klewel was present at the Fresh Conference as part of the InEvent project, InEvent is a European-funded project that is developing new tools for working with recorded meetings, video-conferences, and lectures. Klewel, part of Inevent and providers of the FRESH14 Conference on-demand webcasting, proposes a comprehensive webcasting solution, complete with an audio-visual recording station linked to a web platform that makes it possible to automatically reference, edit and publish content (audio, video, slide shows) in total simplicity. If you are an audio-visual agency that is looking to find the easiest way to webcast events, it can be done by anyone once you purchase our Triskel capture station that is updated with our recently released software to manage the webcasts in a very user-friendly and most of all, timely manner. If you are a multinational corporation, federation, company and you are likely to outsource these types of tasks, we are here to webcast your events and take care of it all. The idea is to capture the event and make it accessible later in order to save knowledge, therefore add value to the conference/meeting/workshop/symposium. Once you have organized your event to be captured by Klewel, therefore you assure it’s continued visibility, it is time to bring some more fun to the conference. We believe that symposiums do not have to be boring. People go there because they are interested in the topic, but just because of the overwhelming amount of new information, attendees tend to tune out after a while and only focus on the networking, rather than the learning… Then they go to an event, where there is a ‘Catch box’ and everything changes. 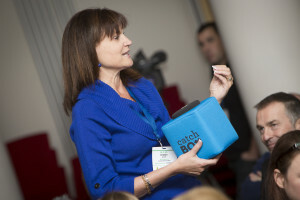 Catch box microphone was introduced at Fresh’14 as a smart and throwable microphone. The Catchbox is a soft wireless microphone that speakers can throw into audiences to kickstart a discussion. Its fast, simple and effective; great for large and even smaller audiences. Now, once you get your audience going, there has to be something for the moderators as well. 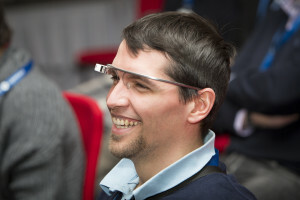 That is why sli.do, the winner of the ETA2013 and FRESH14 Awards, introduced their first Google Glass app for event moderators. It is basically a is a web-based application for speakers and event organizers to easily engage their audience with live questions, comments and polls. To keep things interesting, the meeting-related technologies focus on more and more on web applications to make registering and participating engaging, and interesting for everyone. Spotme, MeetingSphere and Sendsteps. First of all, Spotme invented the mobile event app in 2001. Ever since they have served the highest profile events around the world, working hand-in-hand with the most demanding creative agencies and event owners.There was also MeetingSphere, which is the meeting productivity solution which ensures meetings more engaging and productive where ever they occur: face-to-face or online, same time of anytime or a ‘hybrid’ combination of the formats. A different application is Sendsteps, which facilitates audience interaction during corporate events. Delegates canrespond through mobile phone or tablet via SMS, internet and Twitter. Responses appear realtime and are automatically integrated into PowerPoint.